Speeding Drivers Cause Dangerous Motorcycle Crashes | Hupy and Abraham, S.C.
Everyone has somewhere to be—and fast. Most drivers understand that speeding can cause a crash, but most drivers also think that they have greater control over their vehicles than the average driver. They don’t think that they will be the ones to cause a motorcycle crash. Not Have Enough Time to Assess and React to a Situation on the Road. A driver must frequently react in a quick manner in order to prevent a crash. Speeding cuts the amount of time a driver has to react to urgent situations, making him much more likely to crash. Lose Control. Speeding makes a car or truck more difficult to control. A driver who loses control may swerve into another lane, roll over, or crash into another vehicle. The unpredictability of a vehicle that is out of control makes it difficult for a motorcyclist to avoid an accident with the car or truck. Not See Other Vehicles. 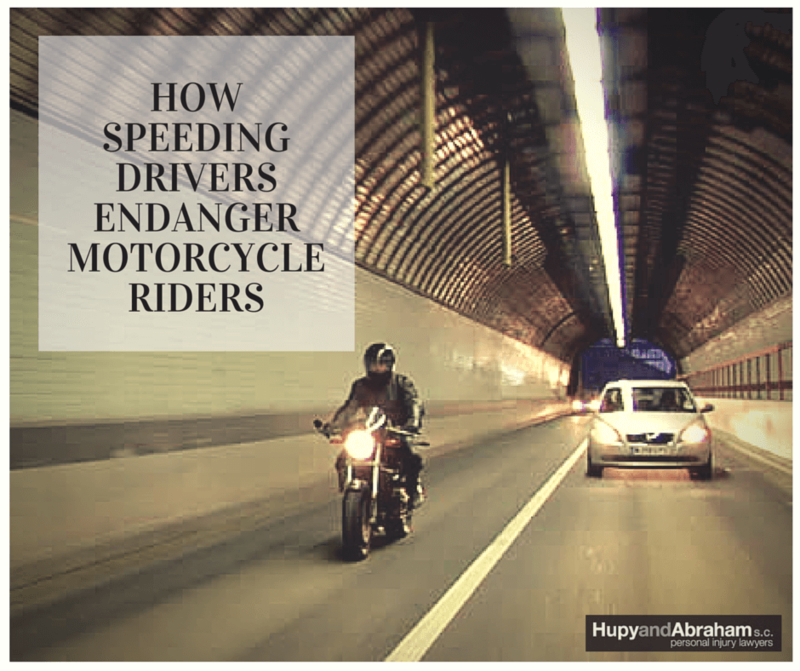 Other drivers often do not see motorcyclists—even when they are traveling at the speed limit. When they are speeding, drivers may have less time to see motorcyclists and may greatly misjudge a motorcyclist’s distance. Thus, riders may be more likely to be hit by speeding drivers. Additionally, motorcyclists are at particular risk of being seriously hurt by a speeding driver when there is a crash because motorcycles lack airbags, seatbelts, metal enclosures, and other safety features. This makes riders vulnerable to significant injuries when another driver acts negligently and speeds. It is against the law to speed in Wisconsin. A driver who exceeds the speed limit by even just a few miles per hour or a driver who drives too fast for the current road or weather conditions may have violated state law and could be liable for injuries that result from a motorcycle accident. If you’ve been hurt—or your loved one has been killed—in a motorcycle crash, then it is important to protect your rights. You can begin by getting the medical treatment that you need, by being wary of insurance adjusters who are pressuring you for statements or to settle your claim quickly, and by contacting an experienced bike injury lawyer today via this website. You should not have to incur the costs of someone else’s decision to speed. Instead, you should fight for your fair and full recovery.